Janice Zulkey and baby Jack. A little over 31 years ago our son, Jack, was born. 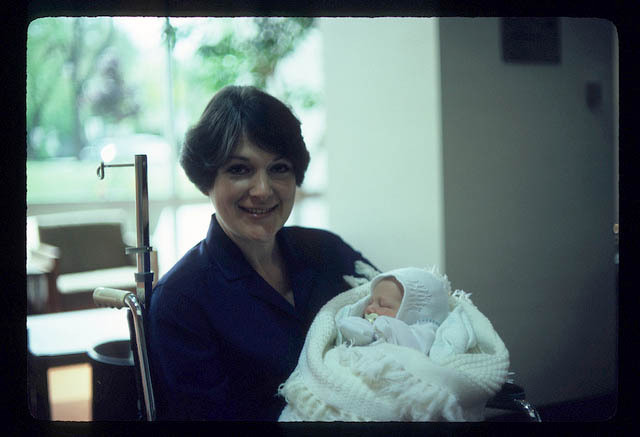 He and I shared a hospital room with a friendly woman named Karen and her son, Tommy, who was born that same day. We all got along quite well and had many things in common: Both newborns had two-year-old sisters, both families were from the north suburbs and it turned out we knew many of the same people. It was quite nice. As Karen and I were preparing to go home, we began to speculate about what would become of our little boys. I don&apos;t know whose idea it was but we decided to keep each other apprised of our sons&apos; progress via Christmas cards. Here&apos;s the thing that amazes Claire — we actually did. The cards crossed in the mail every December, photos enclosed. The elementary school pictures were adorable, the high school notes included news of Tommy&apos;s musical prowess and Jack&apos;s cross-country experiences. Both went on to college and graduated in four years. Tommy went to Japan to teach English and Jack became a Captain in the Army. Now Tommy&apos;s married to a lovely woman he met in Japan and they&apos;re living there. Jack is a lawyer in Chicago. No drama, not ever. Those little boys became wonderful young men — with moms who kept their promises.